Review: A birthday treat turns into tragedy for single mum Manuela when her teenage son, Esteban is killed in a car accident after a performance of ‘A Streetcar Named Desire’ which starred his favourite actress Huma Roji. Esteban is determined to make it as a writer and also to discover who his dad really was. This had been carefully concealed by his mother his whole life. This is one of the Spanish director’s finest achievements. This is a very mature and moving film. It is also a very touching film but not done in a too sentimental way. It is full of coincidences, contrivances and twists. The film is littered with allusions of the Bette Davis classic All About Eve (1950) which is one of my favourite films. At the Academy Awards in 2000 this won one Oscar for Best Foreign Language Film (Spain). At the Golden Globe Awards in 2000 this won one award and that was again for Best Foreign Language Film (Spain/France). At the Bafta Awards in 2000 this won 2 Awards. 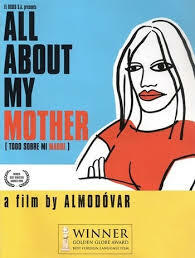 They were for Best Film not in the English Language and Pedro Almodovar got the David Lean Award for Direction. At the Cannes film Awards in 1999 Pedro Almodovar got an award for Best Director.